I've been staying away from my blog for some time now due to my ill health. It's been a couple of days now that I've been really under the weather. Then again... The weather here seems to change from 8°C to 28°C within a few hours, no wonder I'm feeling a bit off-colour. With all the other people around me also a bit coldish means that even standing in a lift is a chance to catch some ugly germ floating around in the thin and processed air. 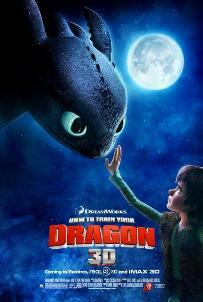 What a wonderful change it was, then, when I happened across one of the latest animated movies from Dreamworks - How to Train Your Dragon. I caught the trailer some time ago before another movie started. I'm not quite sure which one, but I thought the movie it trailed would be great. The dialogues featured in that trailer was dry, witty and rather sarcastic which suited my taste pretty well. After seeing some film stills, I kept off watching it however. How can I ever watch an animated film after Avatar. Everything just seems boring and cheap in comparison. James Cameron's hit film is the pinnacle of silver screen technology, and whoever else not using that tech is not worthy for the big screen anymore - so I thought. On one of those rare occasions I do want to point out that I'm pretty happy that I was very, very wrong. Yes, the graphics aren't as realistic as Avatar. The world is not as nice as Pandora. The characters did not move as they did through motion capturing of Sam Worthington. The story is fantastic and it's just fun to watch. There is a deep storyline which is somewhat lost through the film, but just the dialogue is hilarious to listen to. I really enjoyed the movie even after a second watch. It doesn't have that tear-jerking ability Disney and Pixar seems to have, but it's close. I'm glad some of the other animators are now trying to come up with animations that are not just funny for the sake of funny. Pixar normally has some deeper meaning even when it is funny. It's that special something that connects with you deep down whether it's something of interest to you, or some kind of emotion that they help you rekindle with. It's a great surprise that the movie is based on a series of children's books. I was getting pretty happy and excited about trying to sneak my way into my local English bookstore and ask for the set of these books written for 6-year olds by lying to them that it's for a nephew or something. But if I read correctly, the movie didn't really follow the book much at all. They had to alter it to match what the target demographic would be interested in, citing that the original story was too "sweet." Oh well... Pity then... Could still keep it in mind for when I have kids one day. Definitely worth a watch anyways, and definitely got my mood back up enough to fight off this horrible cold!